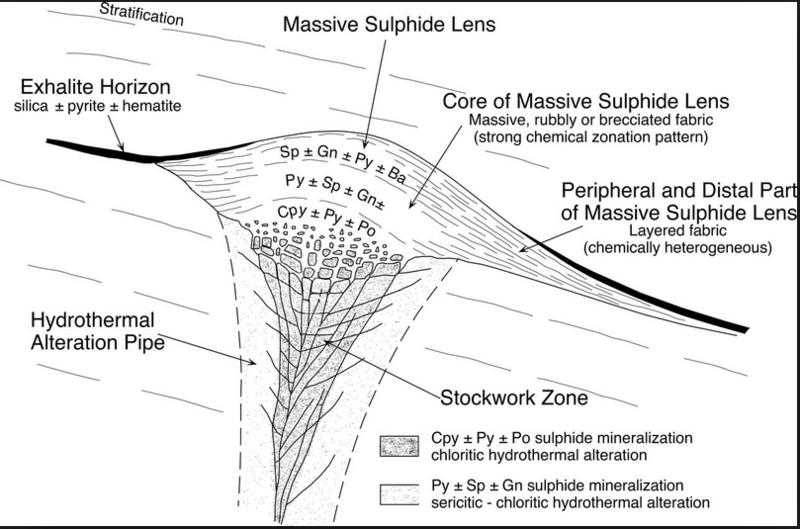 The below idealized VMS diagram shows the position of the exhalites that accompany VMS deposits. 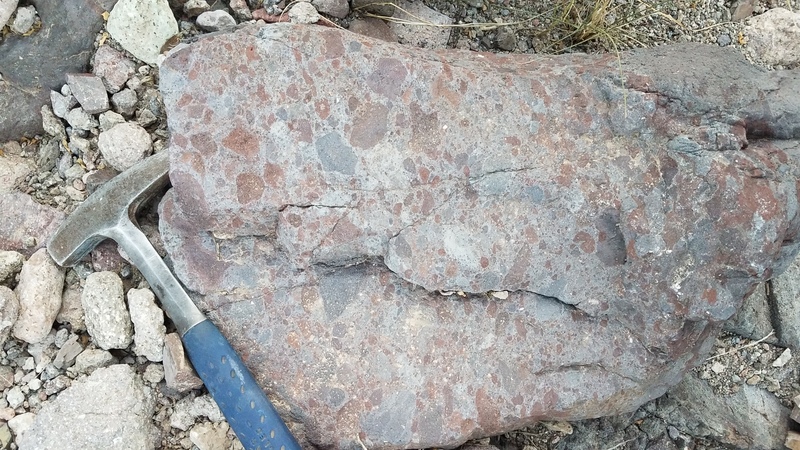 This can be banded jasper (“Jaspillite”), banded chert, Jasperoid beds, and not shown, metalliferous mudstone. This area is comprised entirely of phreatic breccias up to 800 feet thick from the ridgetops to the top of the granite in the interior of the caldera. This is a sub-seafloor deposit as depicted on Ore Genesis page . Because of the porosity and reactivity of the breccias, the great amount of alteration, and its position on the “wet side” of the caldera, this area is suspected to contain the greatest quantity of VMS ore. Most of the exhalites are broken up here due to brecciation. 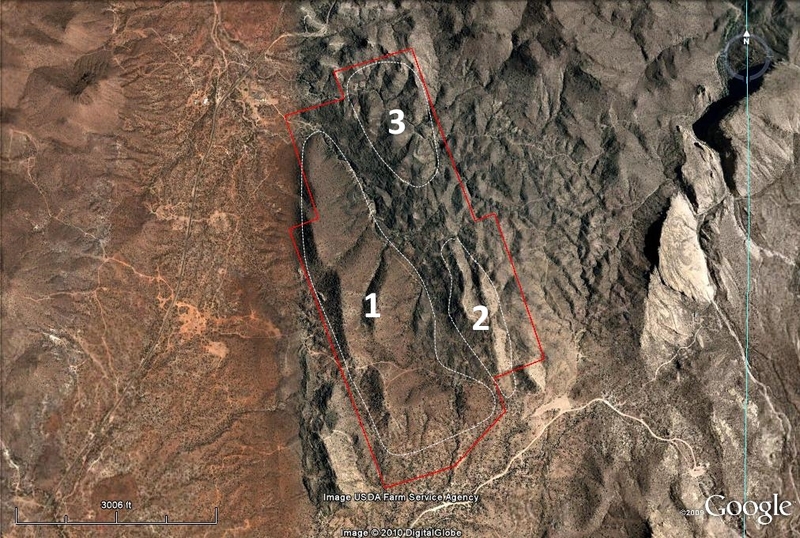 This area contains a VMS in its center, one that was heavily mined in the 19th century. This is also a sub-seafloor deposit but was formed beneath pre-ore basalt. 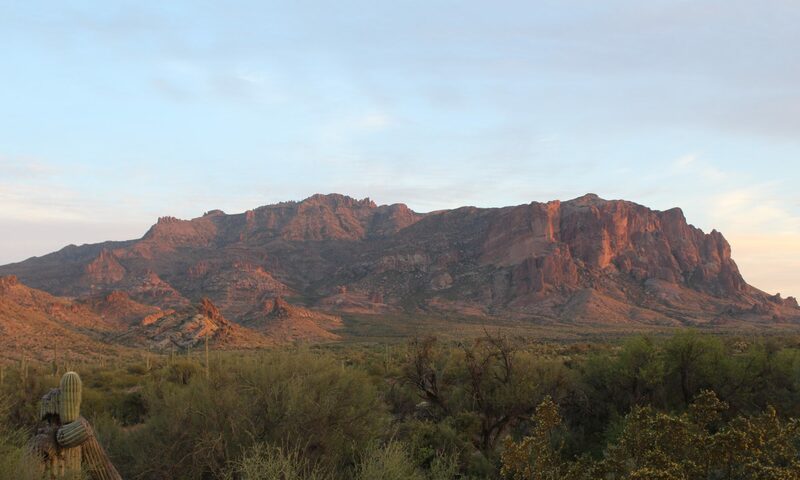 The exhalites here are relatively weak, with the exception to a great amount of gossan breccia that was emplaced on top of the basalt on the hill that defines the deposit. Area 1 has the exhalites of aquifer-hosted Jasperoid beds, Jasper, Jaspillite breccia, and metalliferous mudstone. Areas 2 and 3 have abundant gossan breccias, and Area 3 in particular has a great exposure of banded chert, although this is probably a distal exhalite of Area 1. 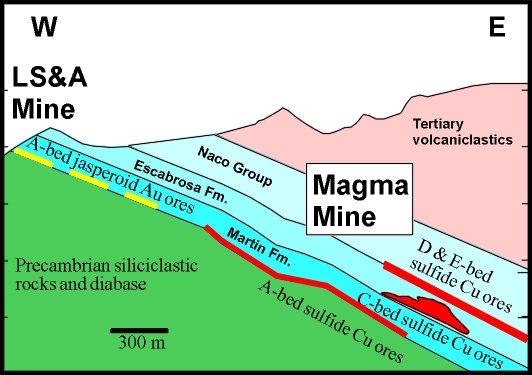 The Magma Mine exploited a great replacement-type VMS deposit, and jasperoid beds were mined up-dip from the sulfide ore for 50 years there at an average grade of .5 opt Au at the LS&A mine. Jasperoid beds were also mined extensively for gold near Wenatchee, Washington. 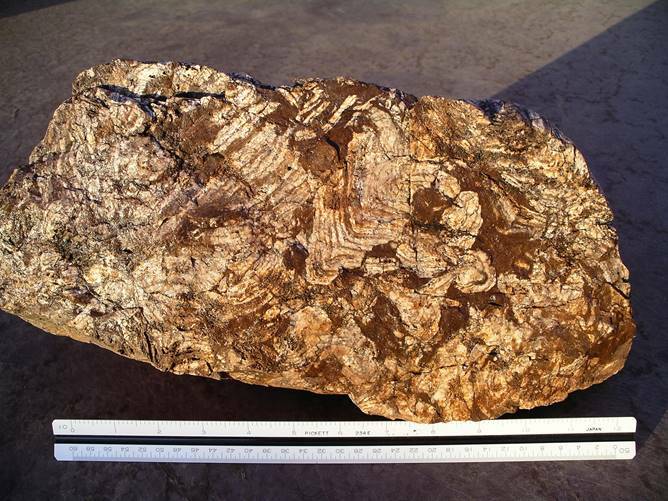 The importance of Jasperoid indicating gold ore in Nevada is well known. The Molly Marie Prospect also has large exposures of Jasperoid beds. 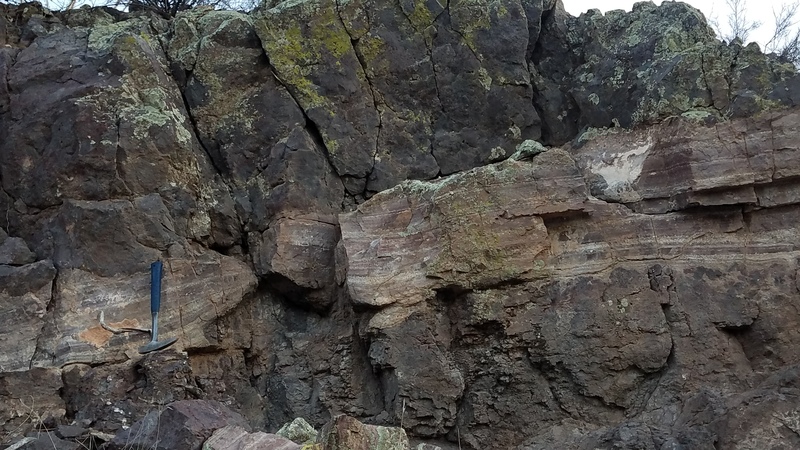 Some of the the many large outcrops of Jasperoid beds at the Molly Marie Prospect are shown below. 2 chip samples of Jasperoid at the Molly Marie ran .02 opt Au. Often, the jasperoid beds are bordered by epidote-altered arkose. Below is a photo of some of the Jasperoid beds at the Molly Marie prospect on the west side of Area 1. The jasperoid was intruded as a gel, and it was micro-fractured if it cooled quickly. 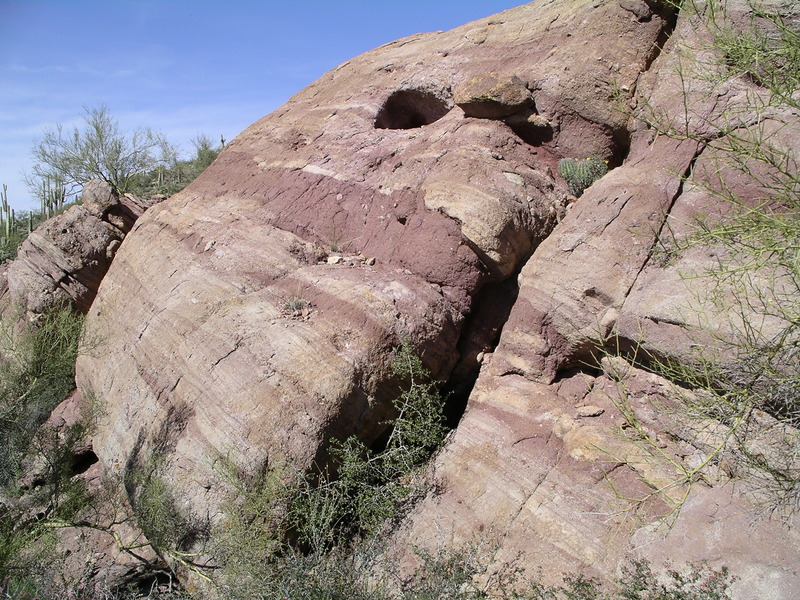 Considering the microfracturing, the jasperoid is sometimes more easily eroded than the host rock, the Whitetail arkose, as is shown in the photo below (west side of Area 1). Like Black Chlorite, Jaspillite is found exclusively near VMS deposits, with one exception, some iron deposits. 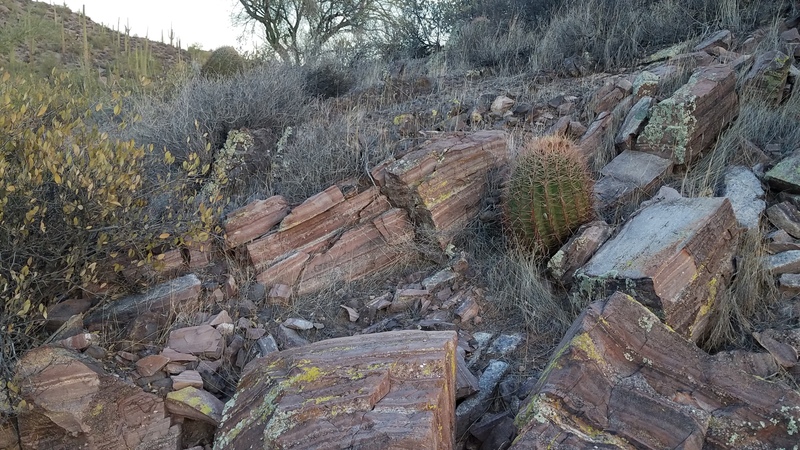 Jaspillite was found in abundance at the huge VMS deposit that was mined at Jerome, AZ. Although the type shown below is not found in a great abundance, pieces can commonly be found in Area 1. 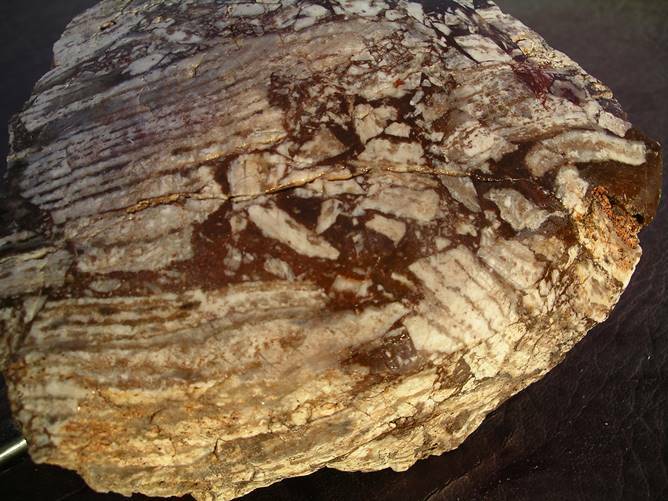 Due to its brecciated texture, it was deposited near or above a VMS. 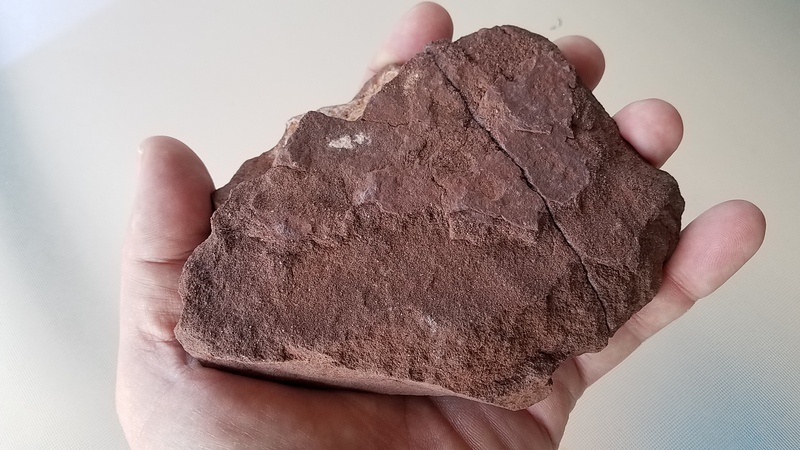 Below is a piece of sawn Jaspillite that was found in Area 1. Below is a darker variety. Note the micro-bedding. Below can be seen where volcanic bombs squeezed and deformed the chert when it was still soft and under water (Area 3). Below is some of the breccia that is lying on top of the chert beds. In the photo below it appears that there were explosions or pressure from beneath this chert bed, and gossan is intruding the chert. This contortion occurred under water when the chert was still soft. 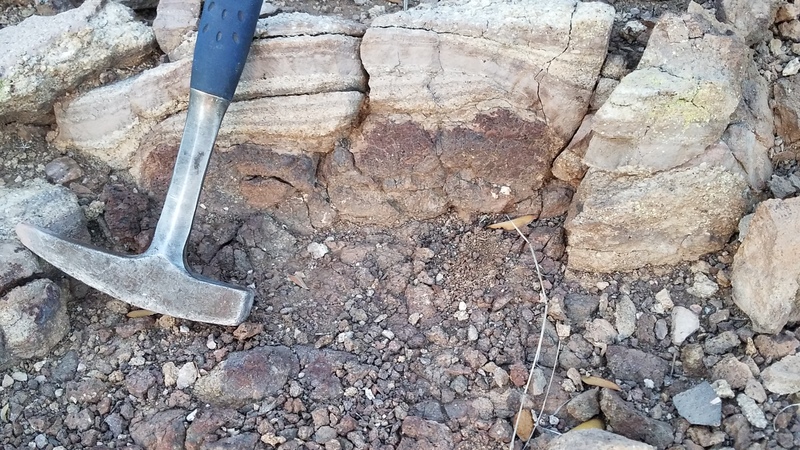 Another important exhalite found is Metalliferous Mudstone beds. Near the outcrop below is found intense black chlorite alteration. This is in Area 1. In the photo below is the same sample above sawn in two. Fine laminations can be seen. 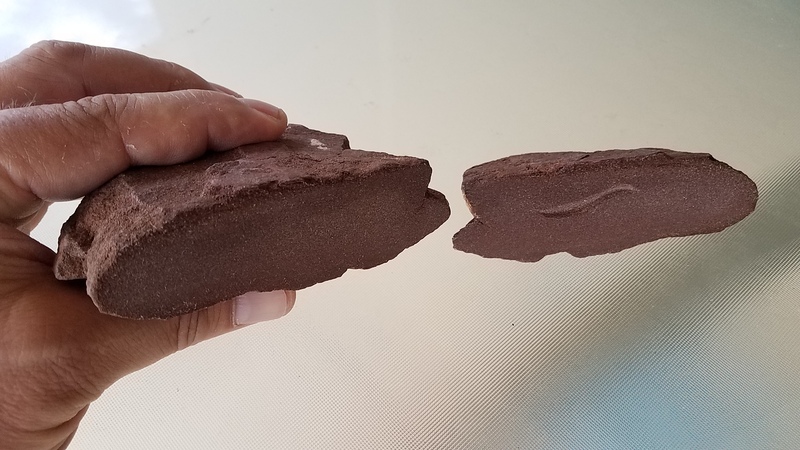 Although it is very erosion resistant, it can be seen that the mudstone can be accurately carved on the piece on the right. With a loupe heavy manganese, quartz, and hematite can be seen. 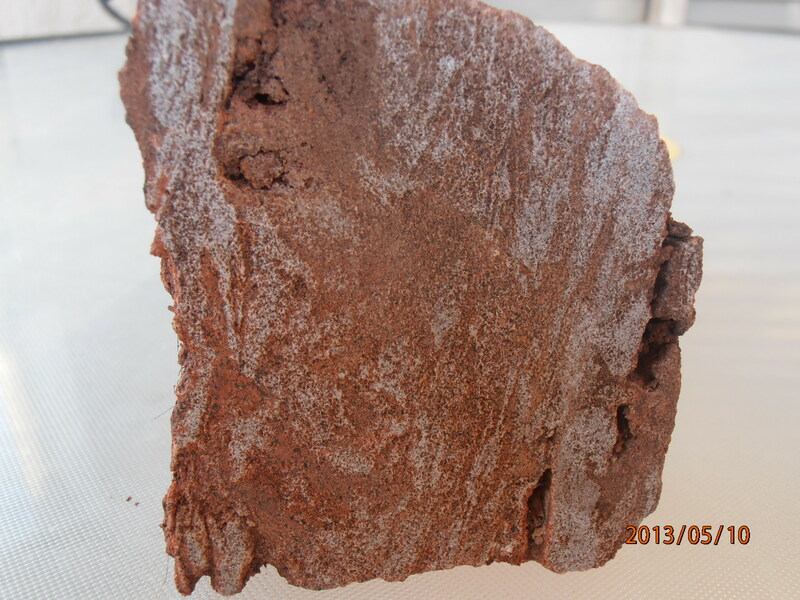 Below is believed to be a piece of friable VMS gossan that was washed down to the mudstone outcrop shown above. 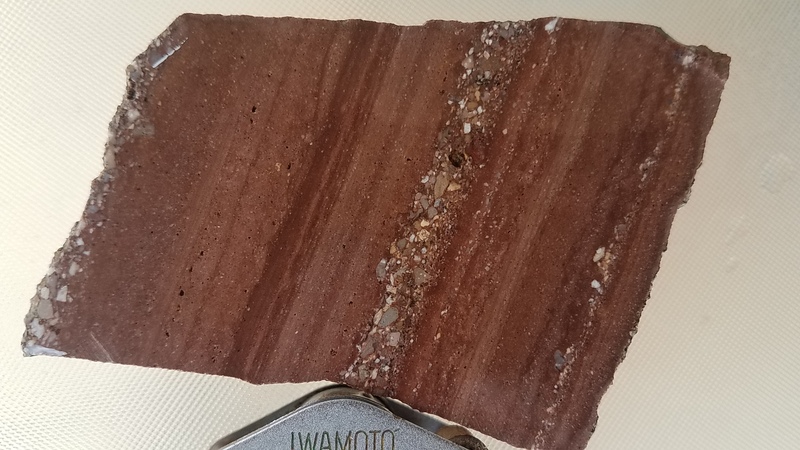 Similar finely layered material with alternating bands of silica and hematite can be found in abundance on the ridges of Area 1, especially on the southern part. On the ridges of Area 1 is found abundant soft saccharoidal silica, another exhalite.